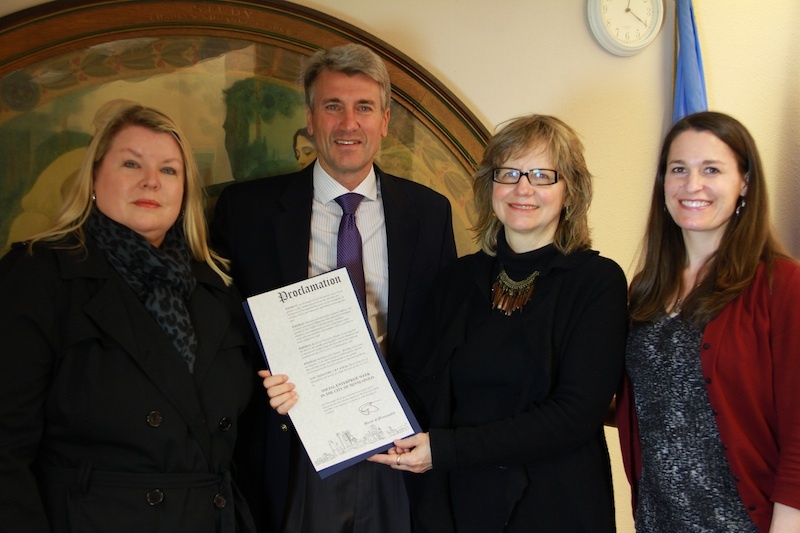 Present at the official signing of the proclamation of Social Enterprise Week with Mayor RT Rybak are Laurel Hansen, Arc Value Village Thrift Store, Beth Parkhill, Mentor Planet, and Colleen Ebinger, Impact Strategies Group. Never heard of social enterprise? Well, it’s here and growing. That’s why RT Rybak has proclaimed this to be Social Enterprise Week in Minneapolis. Minnesota has sometimes been called the “Land of 10,000 Non-Profits,” so deeply embedded is the culture of compassionate support. It’s not surprising that the Twin Cities is ranked #1 for volunteering. But there are a few new twists on this story. Many Minnesota nonprofits are functioning as “social enterprises” – and yet they might not identify themselves as one. It’s a new term for a growing national and international trend. Social enterprises bridge the for-profit and non-profit worlds because they operate with a “double bottom line” — profits and social mission. They sell products and services, which then generate funds that can be used to address social issues. “Not enough people know about the depth of social enterprise leadership and innovation in our area, many started decades ago,” said Mayor RT Rybak. PPL Industries, for example, was launched 30 years ago. Instead of being primarily funded by grants or donations, they relied largely on fees generated by providing light assembly for larger businesses. Their operation provided essential work skills and job training for individuals with multiple barriers to employment. Following a merger with Rebuild Resources last year, the new $6 million organization has been rebranded as Momentum Enterprises. Why are more nonprofits starting or expanding a social enterprise? Some say it is because they are experiencing the “new normal”, based on increasing competition for both charitable dollars and government contracts. To become more self-sustainable, nonprofits are increasingly considering the “earned-income” strategies of social enterprise to support their mission. In 2002, CityKid Java was created to raise funds for a worthy cause: the revitalization of the South Minneapolis community. Since then, they have grown to become a $2 million business selling coffee through Target, Cub, and Whole Foods as well as businesses and faith-based organizations. The “profits” are used to fund Urban Ventures. CityKid Java is undertaking an aggressive growth strategy to use this “business model” to expand and support youth in other states. Social enterprises are as varied as the communities they serve. Twin Cities based social enterprises include the Beez Kneez, The Arc Value Village Thrift Stores, DumpTech, Finnegans, Genesys Works and Tasks Unlimited. Another twist is that more for-profit companies are operating with a double bottom line as well, such as Moss Envy and The Data Bank. The Social Enterprise Week proclamation is one way to raise awareness about the social and economic benefits of social enterprise in our communities. St. Paul Mayor Chris Coleman signed one for St. Paul. And Governor Mark Dayton proclaimed Social Enterprise Week across Minnesota. It’s part of a nationwide effort spearheaded by the Social Enterprise Alliance, a nonprofit that provides tools and resources for social enterprises. The national organization has relocated to the Twin Cities, and is hosting its national summit in Minneapolis this week. “Building an Economy On Purpose” is being held at the Marriott City Center, May 19-22. On Monday, May 20, 50 of the Twin Cities social enterprises will have their day in the sun. It’s the first-ever Twin Cities Marketplace, which is co-hosted by the Social Enterprise Alliance TC Chapter and sponsored by the Greater Twin Cities United Way. The Marketplace will take place from 5:30-7:30 p.m. in the Grand Ballroom of the Marriott. The event is free and open to the public. To follow the event on Twitter, use #SEASummit2013.